Ah, here’s an older card that I still have: Stoutland (BW Boundaries Crossed 122/149). You can read an older review here. 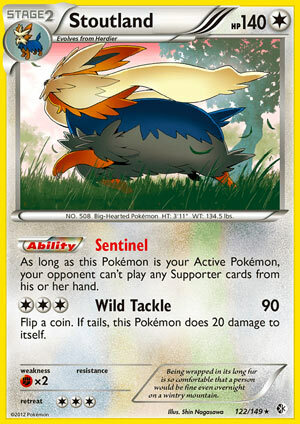 It’s best known for its ability, Sentinel, which prevents your opponent from playing any Supporters from their hand as long as this Pokémon is your Active Pokemon. When it came out, it has gained attention to players that they would be crippled from this card. Our source of draw power mostly came from Supporter cards like Professor Juniper and N, but it can be played around by using pre-errata Pokémon Catcher to put Stoutland on the Bench, letting them use their Supporters again. Nowadays, Pokemon Catcher was downgraded from being a Gust of Wind to being Pokémon Reversal. Even then, there are no shortages of switch related item cards just to get Stoutland away from the Active to the Bench. Decks don’t rely heavily on draw Supporters even though they still need them, and there are other item cards that draw cards, albeit a weaker effect. Even after taking another look at Stoutland after 6+ years, I’m still not convinced that this is a card that players would have to worry about. My apologies to the two dozen or so readers who visited this page before I uploaded this review; I was pretty badly late. You may recall that I was originally very excited about Kabutops (SM – Team Up 78/181) when it was first revealed BUT started waffling after I realized the banning of Maxie’s Hidden Ball Trick meant it actually was going to have to work for success. Locking your opponent out of Supporters while you’re Active is a pretty potent Ability, but it finally has a significant tournament placement to its credit. It didn’t win either tournament but managed 5th and 13th at separate Regional Championships. It isn’t Standard, but Expanded. It also isn’t Kabutops, but Stoutland (BW – Boundaries Crossed 122/149). Though I’d heard of decks going by the name “Shock Lock”, I either never saw the list proper or it just slipped my mind that it involved today’s Stoutland. Ross Cawthon managed a 47th place finish (out of 642 other Masters Division players) at the Daytona Beach, Florida Regional Championship in October of 2017. 2017! Given Stoutland’s original review is from long before Shock Lock was a thing, a second look is long is overdue. Stoutland is a [C] Type Pokémon, so even if the deck attacks for damage (I don’t think it actually does) then it won’t ever utilize or need to deal with Weakness, Resistance, anti-[C] Type effects, or [C] Type support. As a Stage 2, it’ll take some time and resources to hit the field. 140 HP isn’t a lot, but it is enough that Stoutland is slightly more likely to survive a hit than not, all things being equal; if the more you can disrupt your opponent – hint hint – the longer it will last. [F] Weakness is not happy, as many decks will have a way of exploiting it because it is such a common Weakness. Lack of Resistance is the worst. A Retreat Cost of [CCC] does allow for something like Heavy Ball, but I’m not seeing it in recent lists so it is a drawback. “Sentinel” is the focus of this card, the Ability that prevents your opponent from playing Supporter cards from hand. I don’t recall any effects that let you play Supporters from someplace other than your hand, but there are a few which allow you to copy the effect of a Supporter; Sentinel would NOT stop either. Stoutland knows the attack “Wild Tackle”, and can use it for [CCC]; the attack does 90 damage and has you flip a coin. “Heads” means the attack works normally, “tails” means it still does 90 but also does 20 to Stoutland itself. Honestly, not terrible, but adequate at best and probably not even that based on how Shock Lock decks work. There are several things that go into a Shock Lock deck; this is one of those Stall/Control decks which I typically loathe facing. I do not like it when anything, be it ridiculous offense, defense, or control elements turn this into a game of Poké-Solitaire. I am, however, happy to say that Stoutland’s lower Stages are quite relevant in this deck: Lillipup (Black & White 80/114) is essential and Herdier (Sun & Moon 104/149) is handy and I do not just mean as stepping stones for Evolution. Lillipup can use “Pickup” to reclaim an Item card from your discard pile, and Stoutland can do this as well thanks to Memory Energy. Herdier doesn’t combo with Memory Energy; you just can take advantage of its “Treasure Hunt” Ability as another way of snagging an Item from your discard pile, even if it only applies when you Evolve into Herdier. You’ll need to recycle a lot of Item cards, and for MORE than the usual control reasons; the “Shock” in this deck’s name comes from spamming Raichu (SM – Burning Shadows 41/147). Like Herdier, it has an Ability which triggers when you Evolve one of your Pokémon into it from your hand, but its “Evoshock” Ability Paralyzes your opponent’s Active. Depending on the build of the deck, it may also run Alolan Muk and/or Goodra (XY – Phantom Forces 77/119) for their Abilities, to disable Abilities on Basic Pokémon or prevent players from attaching Tools, respectively. The deck has a lot of Trainer-based counters for common threats in Expanded, as well as to recycle other bits of the deck; remember, you win when your opponent decks out. We can see why Kabutops can’t fake this in Standard; while Stoutland is front and center, it’s also just one piece of an intricate puzzle. Even though most of those pieces are also available to Kabutops, the ones that are not – like Lillipup and Herdier – don’t seem to have worthwhile replacements. This is also why Stoutland receives a roughly average score; while you couldn’t just replace it with something else (like Kabutops), it is one cog in a far more complicated machine!